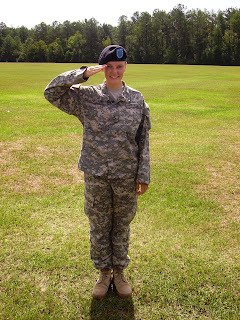 Army Reserve Private First Class Elizabeth M. Williams has graduated from basic combat training at Fort Jackson, S.C.
During the nine weeks of training, Libby studies the Army mission, history, tradition and core values, physical fitness, and received instruction and practice in basic combat skills, military weapons, chemical warfare and bayonet training, drill and ceremony, marching, rifle marksmanship, armed and unarmed combat, map reading, field tactics, military courtesy, military justice system, basic first aid, foot marches, and field training exercises. Libby is currently attending Advanced Individual Training at Fort Sam Houston, TX where she continues her studies and training to become a Combat Medic/Health Care Specialist. Libby is the daughter of Mike and Barb Williams and sister of Katie Williams of Miami Township, Ohio. She graduated from Carlisle High School with the class of 2006. After completion of AIT Libby will return to Anderson University (Indiana) to complete her senior year of college. Awesome! I know your family is very proud of you! Thank YOU for your service to our country and we vets know your in good hands no matter where you serve. God Bless. Great Job Libby. How wonderful to sse young men and women like you taking such pride in serving our country. We are ALL better because of YOUR commitment. Thank you.